I deleted a link to a [Facebook] post last night about women selling MLM products on FB because someone I like and trust said the post was mean and hurtful. But, I’d like to explain here how I feel about MLMs, and why I feel conflicted when my friends add me to FB groups and ask me to support their MLM ventures. Feel free to not read this post, and if we are friends, I hope I can speak my mind and we can still stay friends. I’ve been too poor for most of my adult life to support more than the occasional Girl Scout Cookie drive. But when friends ask me to support their participation in MLMs, I feel conflicted because I believe you are caught in a scam. It is a statistical fact that more than 99% of MLM participants *lose* money on their venture. The FTC keeps a report on this on their Web site. The author analyzed 100s of MLMs and found that, with all of them, 99%+ were losing money on their MLM participation. He also spoke with dozens of tax preparers in counties with significant MLM participation, and the only people who reported making money on their ventures were people near the top of the MLM “pyramid.” The average distributors were all losing money. Of those who do manage to turn a profit, usually they are making minimum wage (or less) for the hours they are putting into it. It isn’t because you don’t work hard enough or because you’re bad at sales. MLMs fail because they ignore one of the most basic principles of business, that supply must meet demand. They urge you to turn your customers into competition, thus oversaturating the market with too much product. They don’t conduct analyses of distributors in a certain area to make sure there’s not already too much supply there; anyone can sign up. This is because the only “customer” they care about are new distributors front-loading their inventory; they don’t care whether or not you actually are able to sell it, and the vast majority of them don’t bother trying to keep track of that. If you wanted to franchise a McDonald’s restaurant, McDonald’s would look at your area and conduct an analysis of whether or not there is enough demand for a McDonald’s in your location. They wouldn’t let four people open four McDonald’s on each corner of the same intersection. But if you want to sell an MLM product, there could be four other suppliers on your same street and they wouldn’t care. Just look at the offerings for MLM products on sites like eBay and the Amazon Marketplace. Those aren’t “stolen” products, those are people trying to offload product they couldn’t sell and recoup some of their losses. Going back to my franchise comparison: if you were going to franchise a McDonald’s restaurant, McDonald’s would have to provide you with hundreds of pages of detailed analysis on what you can expect to make and why, so that you could make an informed decision on whether or not to invest in that business opportunity. But MLMs have voraciously fought the FTC on being required to release even a one-page disclosure statement of what the average distributor can expect to make. They do this because they know that their sales numbers would be abysmal. A lot of MLMs also engage in cult-like mind control tactics, like forbidding “negativity” or telling you not to read information about the MLM on the Internet. I heard that LuLaRoe wasn’t even letting its distributors ask about when the tax system was going to get fixed because that was “negativity,” and now LuLaRoe has had a major lawsuit filed against it over that very problem. If you are participating in an MLM, I would just urge you to do an honest breakdown of expenses versus profits versus time spent on your business efforts. What do you really make in an hour? And please remember that you don’t get any benefits or paid time off, and you will have to pay SECA (which is a bigger bite out of your income than FICA). I don’t make a ton of money at my office job, but I always remember that my employer pays half of my Social Security tax plus around $25K per year in benefits, so my employer is probably spending $70K per year on me—and I only work 37.5 hours per week, with plenty of paid time off. If I were going to work from home, I would need to be able to make $70K per year (*after* expenses) working only ~33 hours per week. Most MLMs can’t deliver that to the average distributor, not by a long shot. If you are truly making money off of your MLM, great; I’m happy for you. But the majority of people don’t. These companies are predatory and they largely prey on women with a “work from home” dream. And that is why I feel conflicted about supporting women in MLMs. OK, let’s do the numbers (facts from Mary Kay website). Mary Kay Inc.’s global wholesale sales were $4 BILLION DOLLARS**. Sounds impressive, doesn’t it. Makes you want to get into that pool of money. 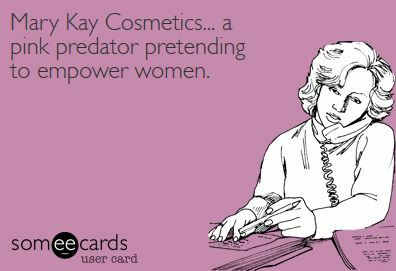 But, unfortunately, there are 3.5 million Independent Beauty Consultants in the world. That means that each consultant’s share of the sales is $1,143 per year. If any IBC sells more, some IBC is selling less, because that wholesale sales number doesn’t stretch. So are you still thinking of building a business on less than $100 a month? Since men will make up an insignificant amount of the client base, we can cut that in half. 267 potential customers per consultant. That’s all women in the USA, from cradle to grave. Not all of these women are potential customers. The cohort of women aged 14 to 65 is 104,000,000*. I recognize that some women below 14 and some over 65 will also be potential customers. So, I will round it up to 120,000,000. 120,000,000 / 600,000 = 200 potential customers per consultant. According to multiple sources*, the average reorder for a MK customer is $157. $10,466 per year… before expenses. That’s if, and only if, you capture every single potential customer. I’m making a guesstimate and knocking 20% off the number of customers, 180. Many sources say that MK has 10% of the market*. 10% of the market is 20 customers. So, we can safely say that the average MK consultant earns AT MOST between $3,140 and $9,360 per year. Remember: None of the calculations include any kind of expenses aside from taxes. While subtracting expenses will decrease the amount of taxes, it will also decrease the gross profit, making all of the above numbers much, much worse. Conclusion: If a Mary Kay consultant focused solely on sales, there is no way to make a living from MK sales alone, much less earn “Executive Income”; start subtracting expenses, and they are more than likely losing money. * Sources provided upon request. AND, if you did your calculations over a 20 year window of exposure, there is even LESS women available to try MK again! The Unit results that are the reality in MK, is that a recruit has about 6 to 10 weeks of “excitement” before they figure out what’s what. They slowly peter off and become personal use…200..maybe 400 a year. ACTUAL SALES RESULTS would keep them happy and building a cosmetics business. The fact that they DON’T, even after all their excitement, is because the REALITY is the REALITY. Friends and family buy to help out. Once that is over, the world is filled with former consultants, turned off women, previously exposed women, and women who “already know/have a consultant”. Mary Kay does NOTHING to address this, because the heavy reliance is on the young “college” gal, new mom, demographic who is unaware of MLM and lacks the experience to spot a good con. If MK cared ONE IOTA about consultant profitability, a nationwide Ad campaign would begin asap, to change the brand, change the reputation, and attempt to make consultantship a real live trained position offering value to the consumer. Oh yeah, and dump the predatory mlm model. I can testify to this. I never thought an ill word towards MK until my friend “recruited” me to sell MK. I would probably still be making occasional purchases right now were it not for that evening where my friend and her director tried to push me into frontloading $600-$3600 worth of “inventory.” Now I’m hesitant to buy from her or anyone else. So that’s a customer down the tubes due to MK tactics. Clicked on this and was like . . . wait a second . . . I wrote that! Glad to see it used. I am in MLM & agree with you on MK, Avon & a couple others. All mlm’s are not alike. I just started a [scammy MLM] business & we make 50% the same day, no quotas, inventory or territories. I know everyone is not cut out to own a business or desires to work smart & not hard for their freedom. John Ramsey, Rbt. Kiosawki, Richard Branson, Trump & the Bible say have a business, so you can help others. Proverbs 31:10-31 was a business woman, Jesus was a carpenter, Matthew was a tax accountant, the disciples were fishermen & repaired nets. I can assure you they sold their services & didn’t give them away for free. I feel many ppl are selfish & afraid to step out in faith to attempt to take some control of their futures & not leave it in the hands of someone else who is wealthy. Instead of feeling like your friends & women who step out in faith to attempt to make a difference in the lives of their family & others are a nuisance or foolish. I believe you could actually learn very good qualities from us. It is not easy to get up every day, doing the same thing expecting a different outcome & never ever see a light at the end of the tunnel. I would rather step out in faith in God, myself & those he places the vision of helping others reach their full potential & freedom than to sit by & let someone else dictate when I can go on vacation, leave w/o pay, etc. Check out my website & let me know what you think. I partner with a [scammy MLM], to help moms & missions by giving us 50% of our sales the same day. I had no help from many family & friends, so I started going door to door. Many hadn’t heard of the company & are interested in joining me. 1 has already (a retired teacher), a church & homeschool sister & homeless 21 yr old young lady. When life gives you lemons, you have to make lemonade, not sit there complaining & not doing anything different to better your life & the lives of others. God is relationship oriented & so are his children. It’s more to life than being a slave to someone who cares not even a penny about you. MLM Scammer – Yes, I changed your name and info to obscure your identity and the company you’re with. Do you have any idea how offensive it is for you to come to this site and pimp your MLM? You should be ashamed of yourself. Holy crap, I thought it was a parody! Like something I would hear on SNL… LOL It just proves the point – MLM victims become mindless drones who spout off anything the uplines tell them, no matter how outrageous. Do yourself a favor and actually verify the claims and numbers they tell you… not just take what they say as gospel. Well bless her little holier-than-thou heart! Idealistic, mouthy, and ignorant, with about a much experience as a month-old puppy. But she knows SSOOOO much better than the rest of that she’s happy to stick her finger in our eyes and tell us what we did wrong. And she knows absolutely nothing about us. I take it back. That goes beyond ignorant. That’s just stoopid. Ok miss “I know better than all of you losers.” I have a question for you. Do you know how to tell the difference between gross revenue and net profit? You’re telling us you make an immediate 50% profit. Surely you’re not claiming that you have absolutely no expenses besides inventory. Or are you? Give it a few months to a year. We know you’ll be back, bloodied and scarred. With your attitude you’ll be a good bit poorer too. – Provide a detailed income disclosure on what the average consultant can expect to make? – Give 100% refunds when consultants aren’t able to move their product and need to return it without forcing them to stop being consultants altogether? – Keep track of what consultants are selling and give them training and guidance which the company pays for? – Check an area to make sure it isn’t oversaturated with consultants before allowing new consultants to sign up? If your MLM is doing all of those things, then congratulations—they sound like a much better company than most MLMs. But I’m not familiar with any MLMs that do all of those things. I have a divinity school degree and teach Sunday school at my local church, I really don’t need a lecture on business people in the Bible. It’s not business people that I have an issue with, it’s MLMs pretending to be legitimate businesses when they’re mostly just scams. Best laugh I had all week. But Jesus, Matthew, the disciples Proverbs 31 woman didn’t have uplines and didn’t have to recruit other ” tax accountants”, carpenters, or fishermen. You’re comparing apples to panda bears using this as an example of why MLMs are good. I don’t own my own business but work in health care. Sorry to hear I’m not helping people (and I’m selfish) because I don’t my own business. My teacher husband will be disappointed to hear that too. that part of your post is ridiculous and enraging.